When I was in school, I always got good grades in math and typing. Back then, you had a choice of Home Economics, which might have increased my cooking skills to an acceptable level, or secretarial classes ... typing and shorthand. I failed miserably at History and Geology. Who would have thought I would end up being so fascinated with the history of little towns. I didn't surprise myself at all yesterday ... 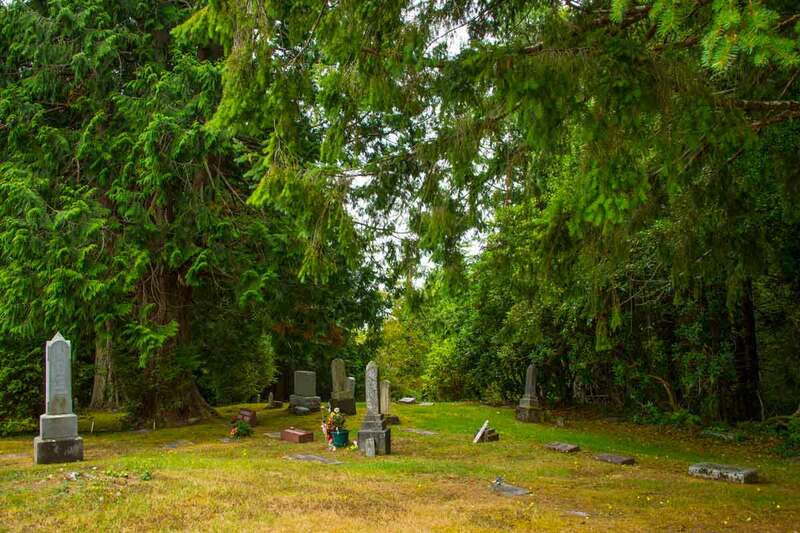 I picked up two more geocaches at the local cemeteries. 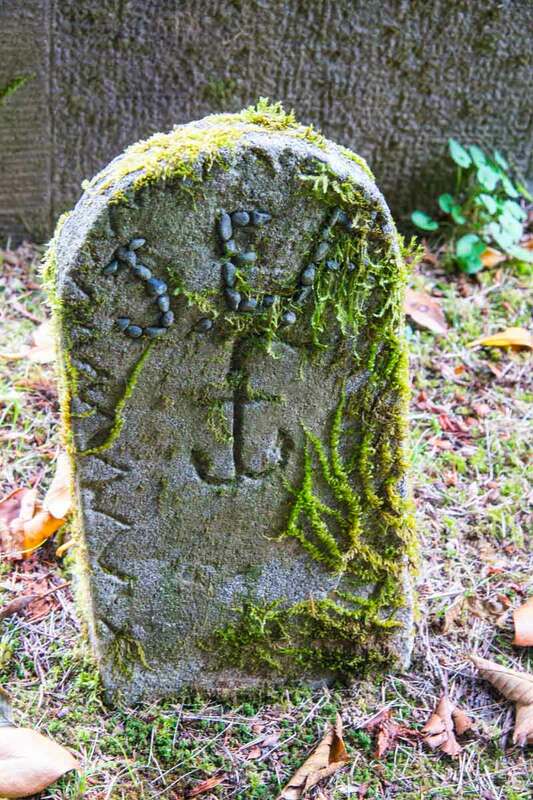 One of the perks of geocaching is the stories you read about what happened in the distant past. 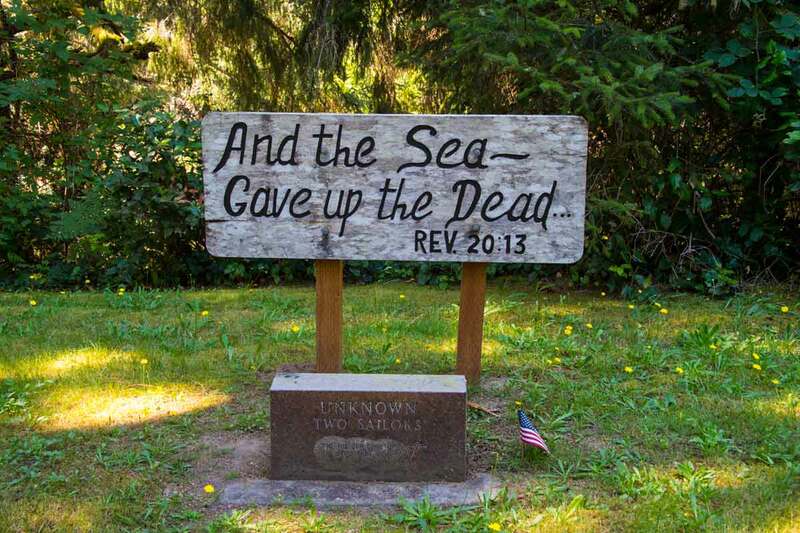 Around Long Beach, it's the many ships that went aground and sank below the waves, sending many seamen to the promised land. In the Oysterville cemetery, you will find two of those seamen who were finally discovered. 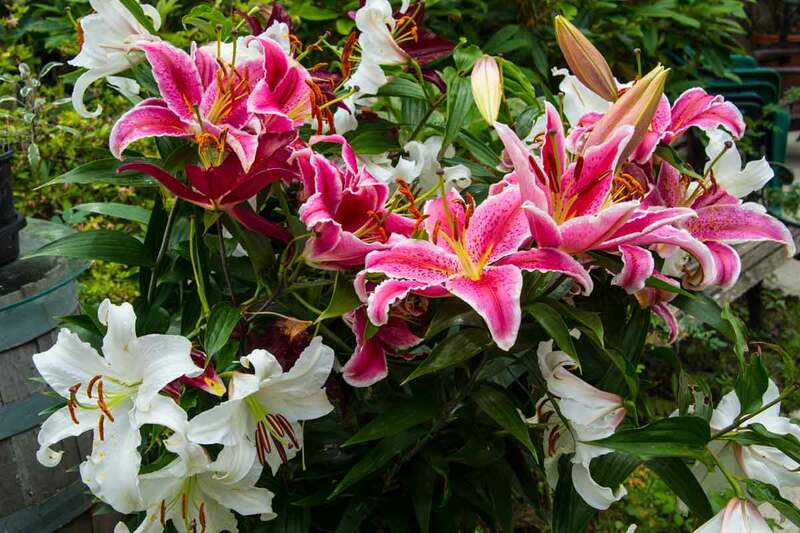 They remain a mystery however, as no one could identify them. 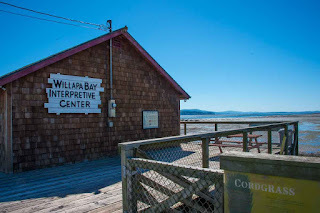 It is said when Lewis and Clark visited here, Clark and Major Espy were guided to Oysterville by Chief Klickeas because of the oysters, which they harvested and shipped to California gold miners. Local lore however, seems to stick to the Chief Nahcotti version. That it was HE who met with Clark. Notice the difference in spelling? 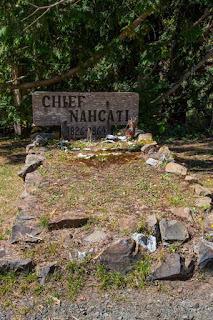 There WAS a Chief Nahcotti, but in fact, no one really thinks he is buried here. Interesting, right? I just love a good mystery! 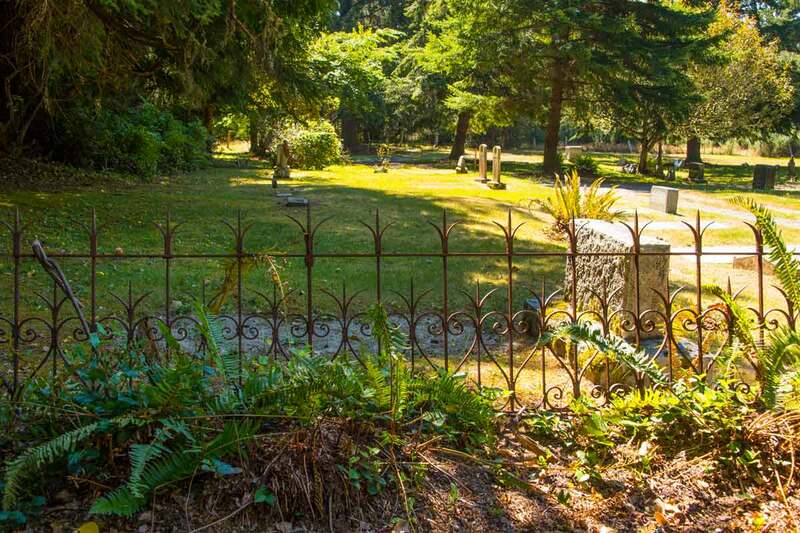 Many of the Espy family are buried here in this corner with the beautiful fence. Willard Espy was a writer and Manager of Public Relations for the Readers Digest magazine. 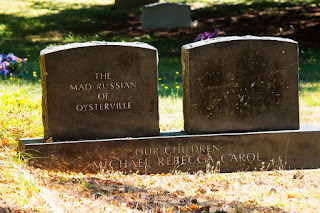 Although he spent most of his time in New York, he was raised in Oysterville and wrote several books in his grandfather's home. 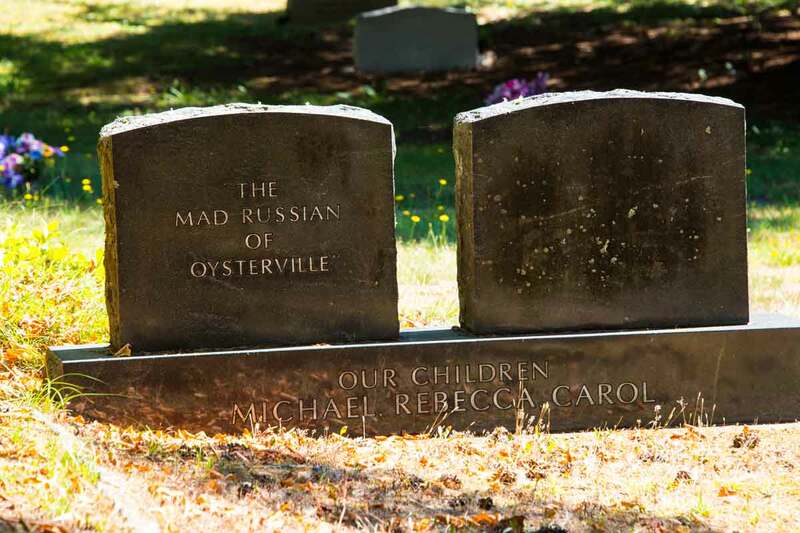 Here lies the Mad Russian of Oysterville, Stormin' Norman. As you drive through Long Beach, you will see the huge store of the same name. It's interesting that I cannot find ANY information on Norman Dutchuk other than his birth and death dates. He must have been a character! Ned Osborn's story is a sad one. 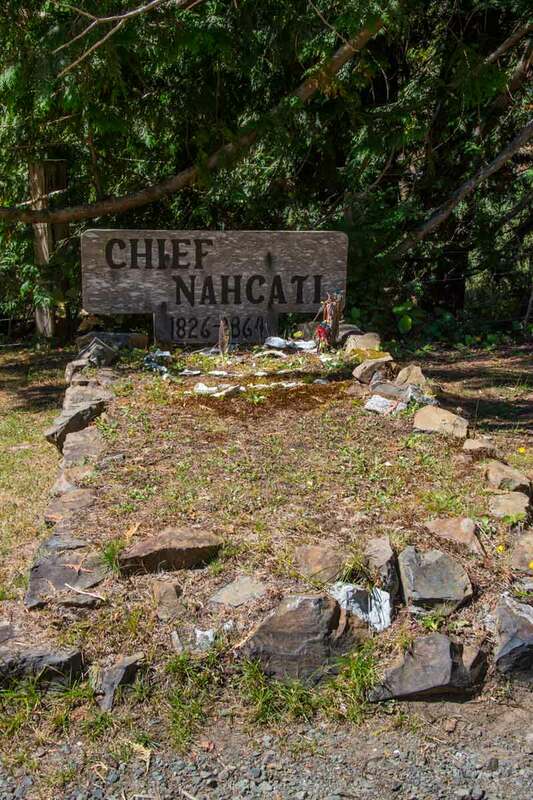 No one knows when he was born, but he arrived in Oysterville aboard the schooner Sailor Boy and here built a house for his fiance. She jilted him, which is a shame. It's a really cute yellow house hidden in the trees. 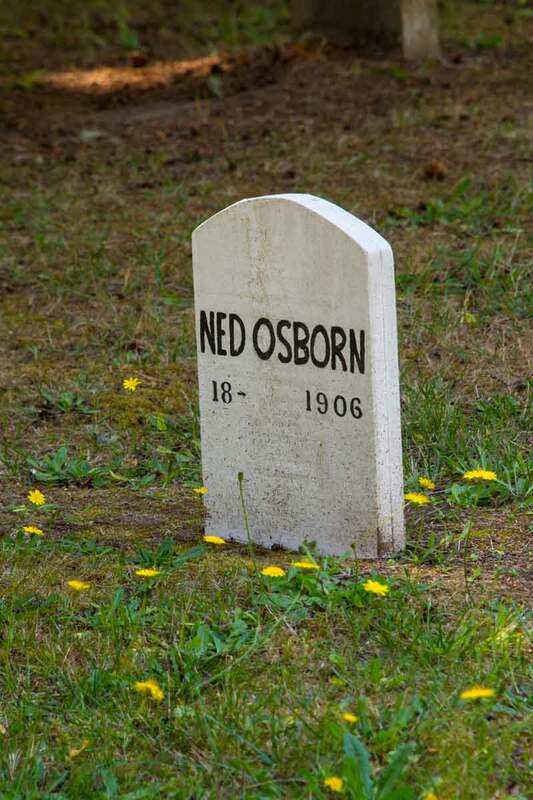 When she married another, he quit building the second floor and lived on the main floor, a confirmed bachelor until his death in 1906. Seems I'm always a day or two late. I would just LOVE to get my hands on one of these houses and fix it up. 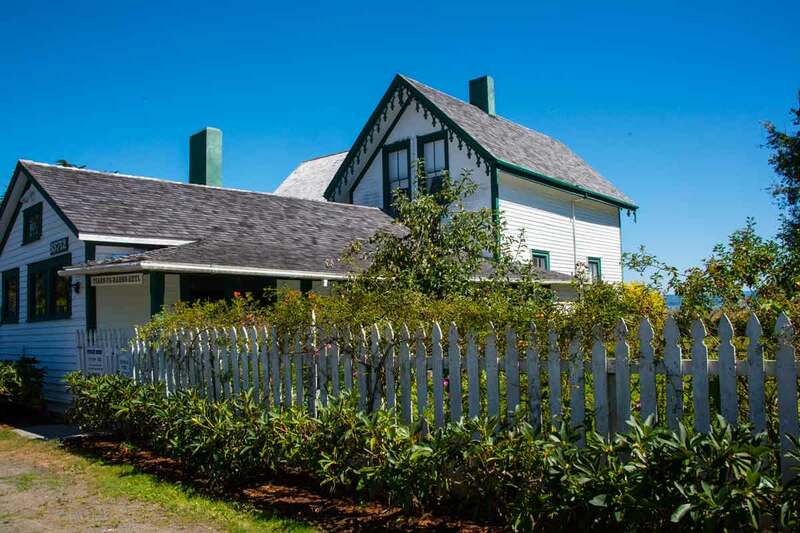 Although the little signs try to convince you the descendants of the original settlers still live here, you might be misled according to locals. 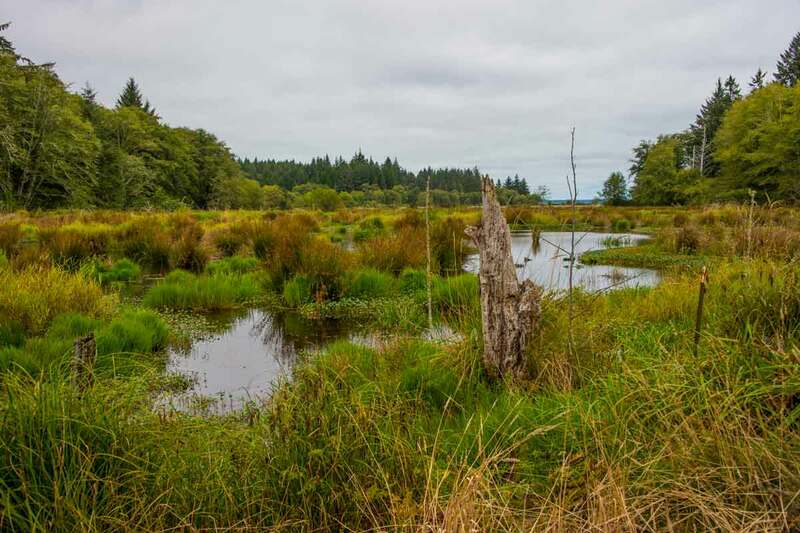 Sometimes geocaching will take me into the wild blue yonder ... or at least ten miles up a one lane gravel road ... where I discover lots of amazing things, like this beautiful slough area. I also discovered a huge tract that had been clear cut for lumber, but now holds a secret. A stinky one at that! Cut down before the idea of reseeding, it has become an experimental plot for fertilizer products. "Poop! There it is" was the name of the geocache. Need I say more? I laughed when the cache container was ... you guessed it ... fake poop! I looked three times before I touched it! 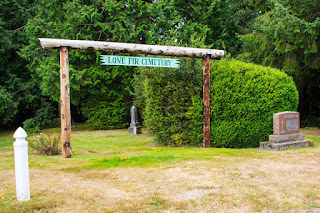 Next up on the geocache list was Lone Fir Cemetery. The lone fir has been taken down since it became a hazard to visitors. In 1839 there were 151 people living on the peninsula. That number increased when Claim Laws were passed in 1850 giving a married couple 640 acres of land just for moving here. In 1854, the first meeting of the Washington Territorial Legislature was held. The first nominee died of pneumonia, so Jehu Scudder took the job. 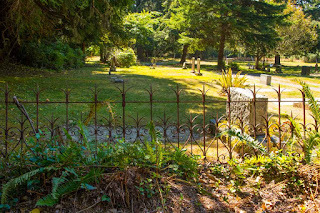 He died before he reached the meeting and was the first to be buried on this land he donated for a cemetery. The next nominee died one day AFTER the meeting. I think I would have passed on that position. 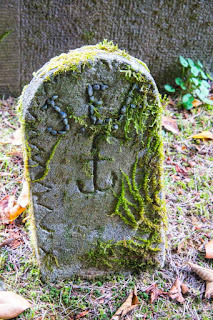 There are many headstones handmade of concrete and a few of wood still left in the cemetery. It seems something bad happened around the early 1900's, as many children and parents died about the same time. I'll probably be staying inside today as a big storm has hit the coast. Most of yesterday the winds kept it off shore, but at 3:00 am it hit here with gusto!! Of course that means I've been up since 3:00. Maybe a little indoor antique shopping is in order! As much as I would love to report that was ME in the bushes last week, alas it was NOT. This is a picture of Ledbetter Point in Willapa Bay. It's that long thin line of trees in the middle left. You can take a shortcut if you don't mind getting your feet wet, or hike around about 2 miles. 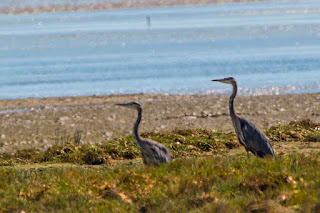 Not only were the coyotes out that day, so were the cranes and birds that feed in the mud as the tide recedes. I'm sorry to say there were no eagles, although I did hear one screeching way off in the distance. As I hiked through the neighborhood, I found the kite you lost last week. 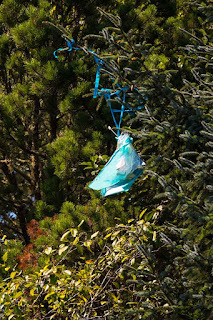 This side of the bay is very protected from the winds, so I imagine it came from the kite festival ... or maybe not. I do like to pick up trash along the beach and always bring a plastic bag, but this was too high to reach. 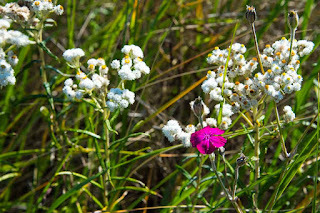 Flowers, or weeds as the case may be, were all in bloom. 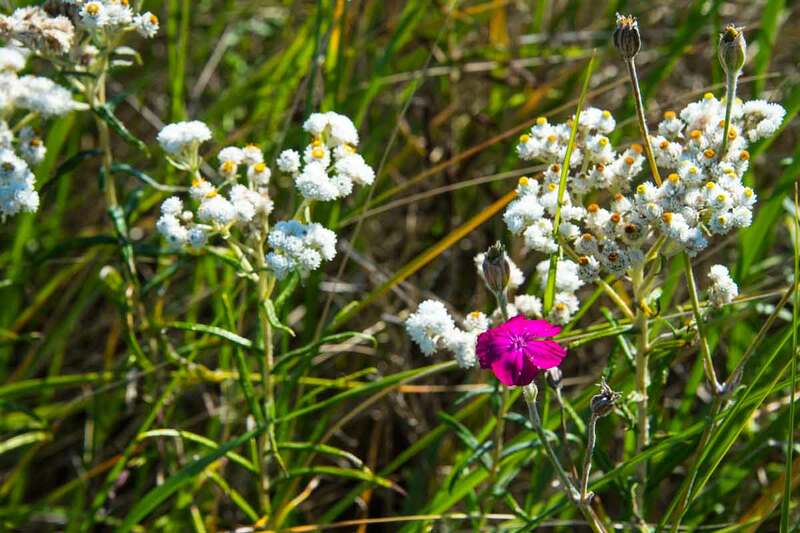 Every once in a while you run into some beautiful pink ones amidst the greenery. 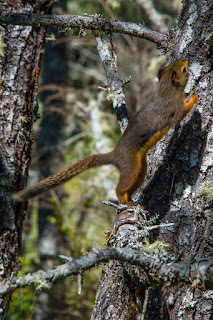 On my way back through the trees, I kept hearing rustling in the bushes. Just as I looked up, there was this baby scampering around the tree about two feet from my head. What a bold little guy!! He jumped down, moved around in the shrubs, then back up the tree, so I grabbed my camera and waited. 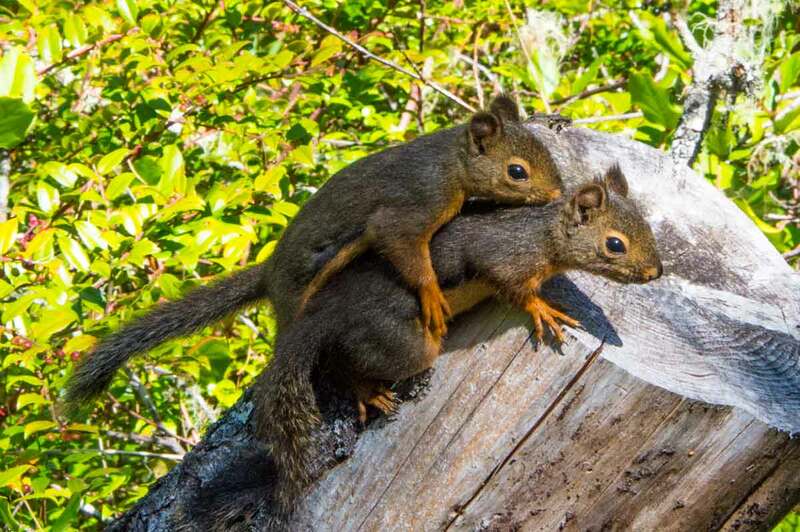 By now the bushes were shaking all along the forest floor, so I figured there was more than one. 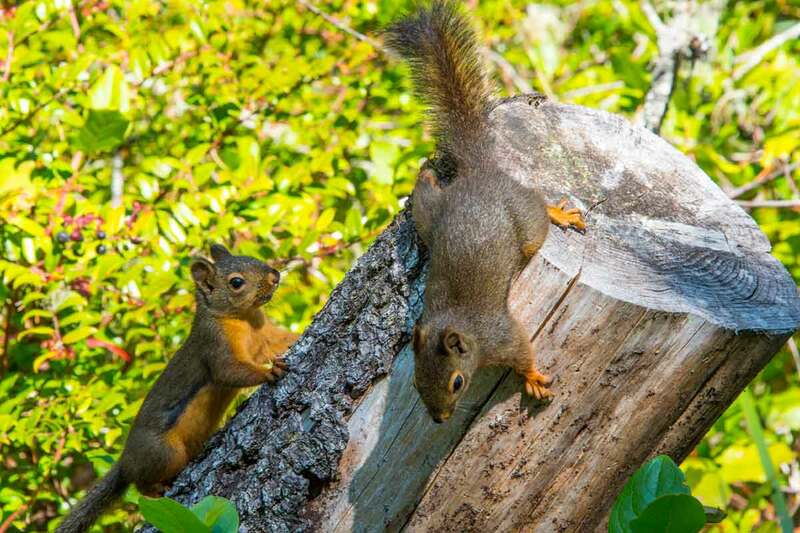 Low and behold, these two jumped up on the tree stump not three feet from me. What cutie patooties!! It didn't take long to figure out what was going on. 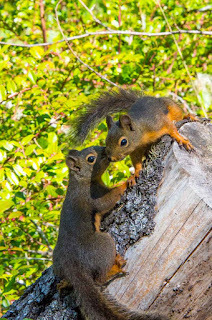 One was obviously chasing the other, whispering sweet nothings in her ear and giving her kisses!! 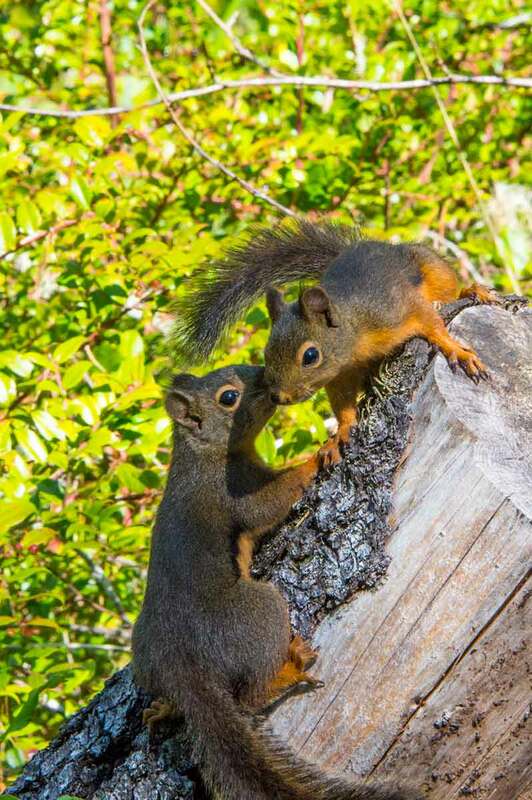 "I love you baby, really I do" .... but before I could even snap another picture, they were off on the run again, this time up a big tree out of camera range. No, NOTHING happened!! She was just playing him along!! 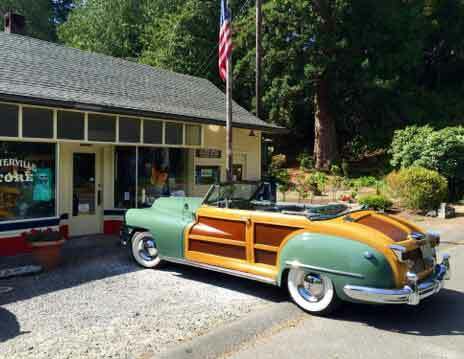 On my way back home, this beautiful convertible Woodie was parked at the Oysterville Store. It seems one of the big houses in town is owned by an Architect with a passion for old cars and big buildings, the biggest of which is just down the street and looks like a dump. Inside however, it has white columns and an amazing polished dance floor. I'll try to get some images for you!! Close to home, I spotted a full to overflowing parking lot at the Corral Diner. This is the place for Nick Russell and Dan Chance, who both love a good burger. Here's a bacon, mushroom, swiss burger (at the recommendation of the waitress) that was just amazing!! It was so good, I ate the whole thing!! Not the onion rings though ... I saved those for breakfast! You can take it with you or eat on their umbrella covered patio. This is a must stop in Long Beach. one head of broccoli, chopped into small pieces. I served it with white rice and it was pretty tasty. It's a good thing I like it, because I have enough for four days!! I've no idea what's on the schedule today ... I'm going to surprise myself!!! Lessons Learned ... Until I Forget!! It was just a matter of convenience when I picked this bowl to mix up a batch of cookies. Yesterday was Sunday and I chose to hang out with the puppies, watch football and bake. The lesson had already been learned but forgotten. This bowl is not very deep and it has slanted sides, not the straight up and down sides that are required for this project. You wouldn't think that mattered much, but it did. As soon as I began to cream the butter and sugar, it splattered out the sides of the bowl all over the counter, the floor and me!! That was bad enough ... I still had flour and oats to go. What a mess!! It took me longer to clean everything up than it did to bake the cookies! I put butterscotch chips in this batch. It's funny because they almost taste like they have alcohol in them! That's a good thing, right?? You would think I had learned my lesson when it comes to knitting, but I'm still trying. At the Purly Shell Fiber Arts store in Illwaco, I was greeted by Maximilian. That's not his real name. I couldn't get over his haircut, so when she said his name four times, it went in one ear and out the other. It's really something like a Roman Soldier. Anyway, he's a sweetie pie! Don't try to pet the other one, he bites. Lesson learned on that one! I bought this beautiful skein of hand spun yarn to make "something", I'm just not sure what yet. Although I try not to buy yarn or material unless I have a pattern in hand, I haven't quite learned that lesson. Well actually I have, I just choose to ignore it!! The good news is I finished the cowl with NO mistakes! How amazing is THAT!! Yes, it was pretty easy, but that's the lesson I learned about knitting. Start with easy things and use lots of stitch markers. In the store, unlike most yarn stores, they have many samples of shawls and gloves, things you might actually use. All the patterns are downloaded from Ravelry.com for free ... and so I did. I downloaded a pattern and had it in hand when I got to the store to buy yarn. Here's the new project ... a shawl/wrap. Wish me luck ... no mistakes SO FAR! You would think I learned the lesson about Jonathan's cage some 40 years ago. No matter how neat and tidy I am about keeping it clean and the newspaper flat so he can't grab it with his beak, he always gets a piece of it and rips it to shreds. It's his favorite pastime ... that and chewing on sticks. This is about five minutes of his work. I wish the cage builders would add one inch to the height to keep the bottom tray away from the grate. Apparently they don't OWN any birds, they just build cages. It takes twenty minutes to clean up the mess, which includes dragging out the vacuum to clean the mess I've made on the floor trying to get it all in the garbage can. The lesson is "don't get involved with a parrot". They are a life long commitment!!! Here's a good lesson for all you RV'ers out there. Use of Duck Tape #2003. When you wreck the front of your fifth wheel, or maybe the back of your Class A, just grab several rolls of duck tape. It made the entire front aerodynamic and waterproof?? No, you can't open that window, but who needs fresh air. These guys were an easy lesson learned. They are my best buds and great company. Even though I can't go to Hawaii any more due to lack of dog sitters, I wouldn't trade them for the world. I'm a little late, but Happy National Dog Day!! Gosh, there's a day for EVERYTHING! There's a couple more things ... when you write notes, don't just put something down like "no neat paper" because the next day you won't have any idea what in the world that meant. 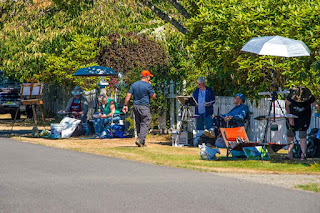 Always try to leave the RV park by the appointed time, not two hours later like my neighbor, and if you clean your sewer hose by sticking your water hose inside, you are bound to learn a really BIG lesson, as will Duck Tape guy. It's been overcast and rainy the last couple days, with no wind to speak of. The lesson here is never plan on anything that requires wind, because most of the time (this year anyway) you'd be out of luck. Sometimes you just have to slam on the brakes and stop. I've seen the sign on the road several times just south of Illwaco ... Lavender Farm, but the driveway foliage totally concealed everything. I didn't want to barge into someone's private property without an invite. So when I saw the OPEN sign, I hit the brakes. You will not believe what I found!! It was like going back to Camelot. There were red tents, gold cords, white flimsy curtains and gorgeous flowers everywhere. After looking at the few things they had for sale ... lavender oils, lavender cookies (? ), sachets and a few not-so-old antiques under the easy-up, I was offered a tour of the property. Of course I said YES! 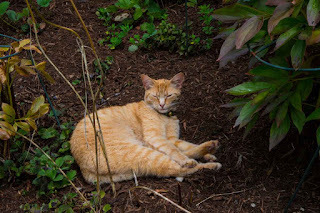 Resident kitty was sleeping in the flower bed. The cute boat named Tinker Bell was a good clue to the ambience of the property. It's like a fairy garden here. All the red velvet swags over the stage were for the upcoming belly dance competition, including instruction by world famous dancers. Not being into that kind of exercise, the name didn't ring a bell or stick in my head. Sorry, no pictures of the stage as Mom was still decorating. Come to think of it, there were pillows all around the stage too. I'll leave that to your imagination. Anyway, this is the entry to their house ... a koi fish pond, statuary and water fall, surrounded by wrought iron tables and chairs. She said her father built everything and her mother decorated it all, including several painted murals. 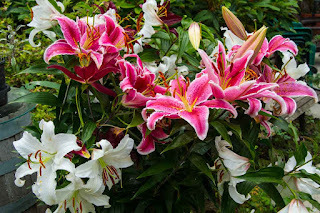 There were huge clumps of lilies that smelled divine, along with little gates and walkways around every corner. 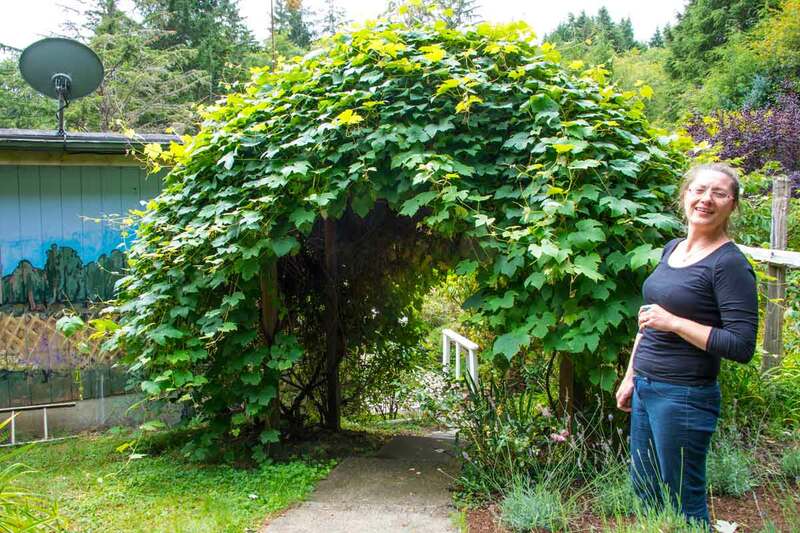 You can get some great ideas for your own garden here. 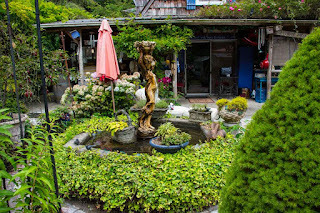 The entire place is actually built on the side of a mountain with recycled everything! 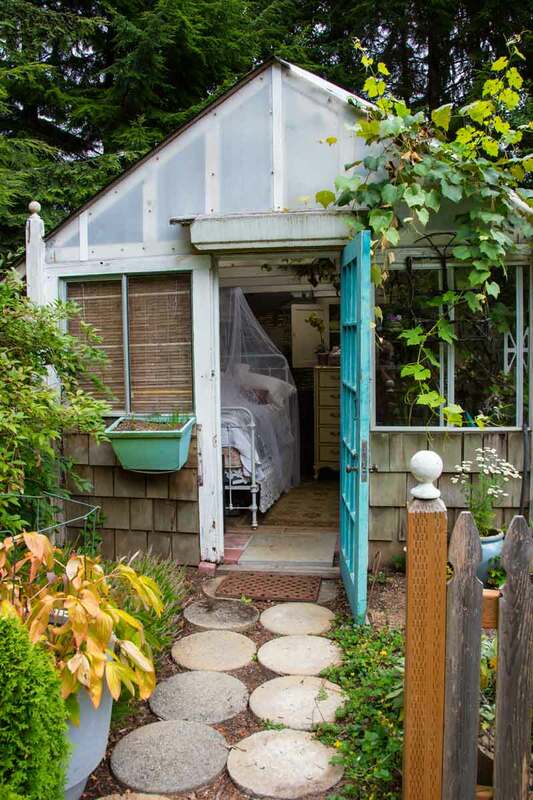 There were two little cottages like this one, complete with beds and antique accessories. This would be the temporary home of the belly dance instructor. Outside and to the right is an outdoor bathroom. I'm not sure how THAT'S going to work out, but it has everything a normal bathroom would have, most of it made of rock. 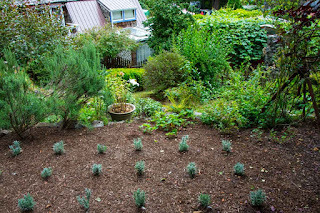 Apparently lavender plants last for 10-15 years before they have to be removed to start again, thus the new plantings. You can see how high up I am ... that's the roof of the house below. As we walked around, we were followed by TWO kitties ... twins ... and four chickens. 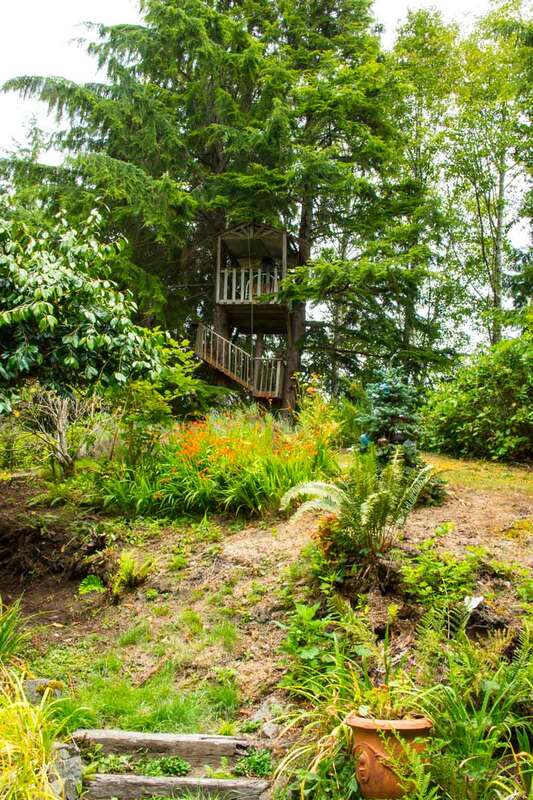 On the other side of the house is a treehouse with TWO levels for your reading or rope swinging pleasure. I'm telling you, this place is definitely worth a visit. Maybe leave your husband home, or bring a good book and buy a lavender cookie for him. This huge grape arbor came from one Sonoma Valley plant that appears to love this environment. What a great place to live!! By the way, if you come in August for the Belly Dance Festival ... everyone is invited ... I'm sure your husband would LOVE to stop in!! My next stop was at the farthest end of the peninsula. This is the Oysterville Store, only open on Friday and Saturday. 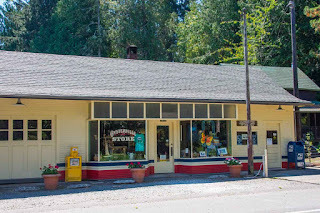 It's full of kitschy things, most locally made, but totally worth the visit just to see the building. That's the post office on the right hand side. 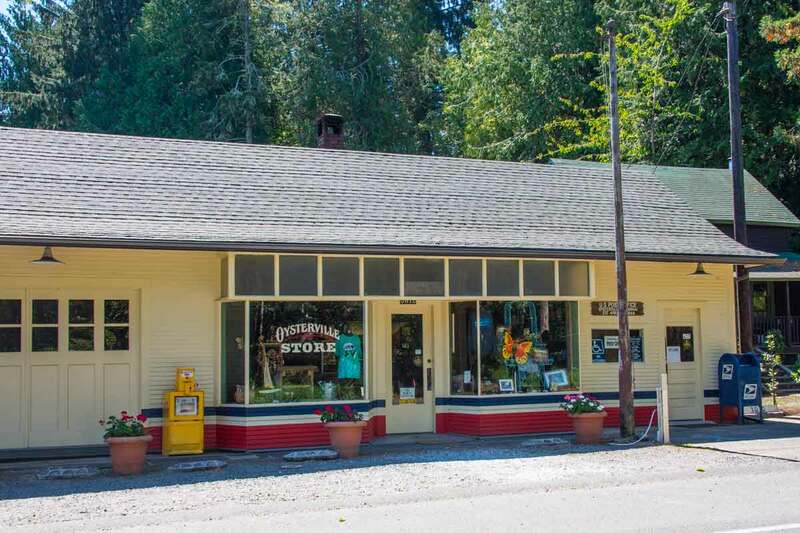 In this remote area, the post office has never had it's own building. It was located either in someone's house, or in the back of a store. Purchased just four years ago, the new owner is fixing up the store and the house next door, along with his bruiser of a shepherd. At his feet is the remains of a tree he's been chewing on! Here's one of the local crafts I picked up in the store. There's an elderly couple here who work together. He gathers and cleans the oyster shells, then drills the holes while she gathers the cranberry vines and makes the basket. This is actually the bottom, but I love the oyster shell pattern. 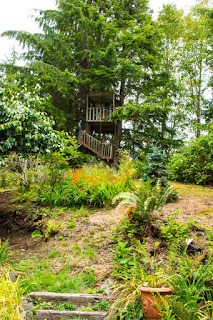 There are lots of hidden gems in the trees around here ... you just have to take some time to look and explore ... but wait until you see the OPEN sign!! Today I received 72 ... yup 72 spam emails from various people like John Smith and Mary Roberts. I've no clue where they got my email address or what they wanted, because I summarily deleted them in one fell swoop. It's funny to think that someone had to sit there and type in name after name as the sender. I hope they at least got minimum wage for their trouble. I'll put it plain and simple. I HATE them!! Many eons ago in a small village along the coast, I ordered the Fisherman's Plate. How could I go wrong if everything is fried, right? Unfortunately for me, I took one bite and discovered the fried oyster was bad ... as in rotten. Ever since, no oyster has come within three feet of my mouth. That doesn't mean I'm not fascinated with their production and harvest, I'll just never get close to one again. So why would I drive up to Oysterville? Because it's there ... and it's very old!! 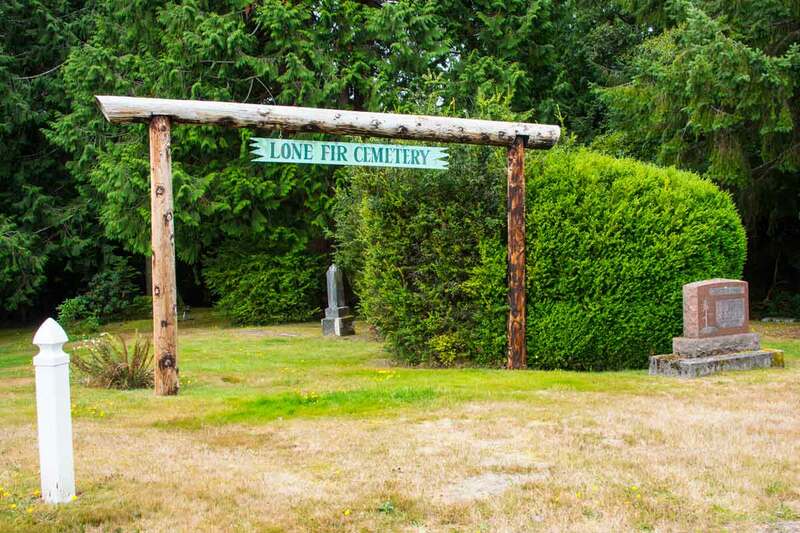 The first settler John Douglas came here in 1841 and married a Chinook Indian woman. 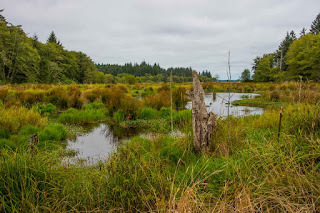 This being right on the edge of Willapa Bay, it was the perfect spot to harvest all those oysters when the tide went out. 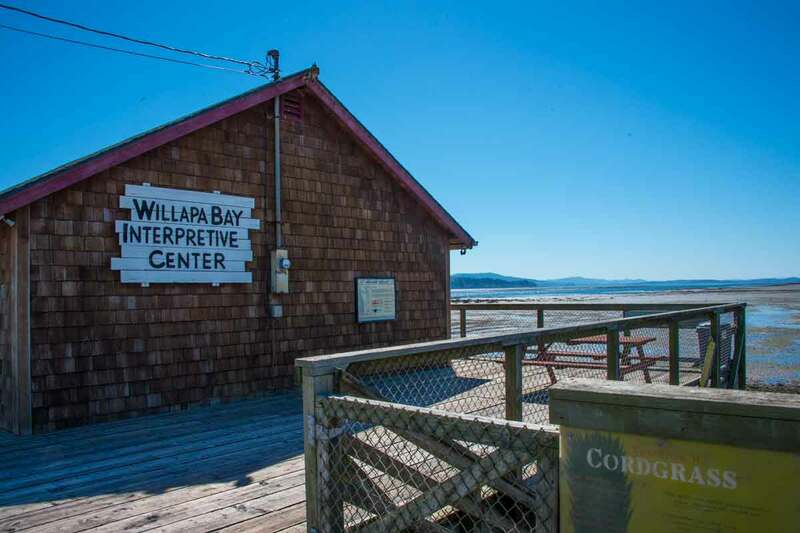 There are many interesting historical spots around, including the Willapa Bay Interpretive Center, where a geocache just happens to reside. 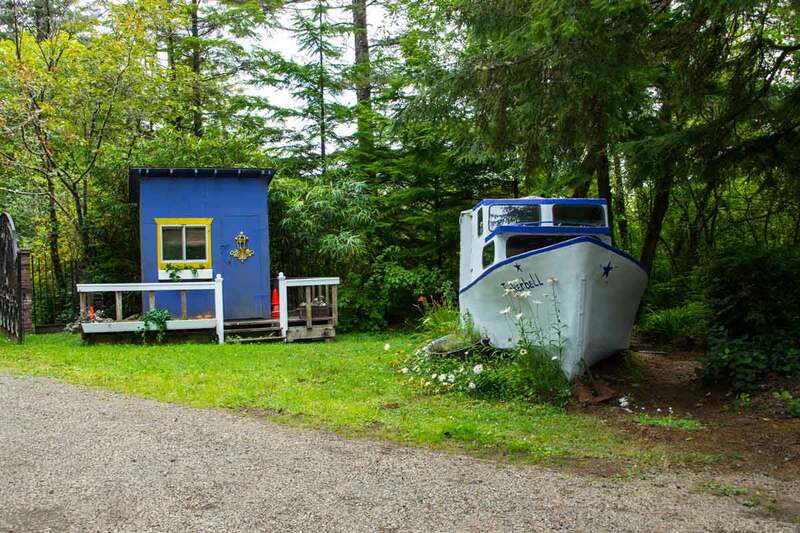 Although only open on weekends, this building is a replica of an actual fisherman's house, complete with boat. 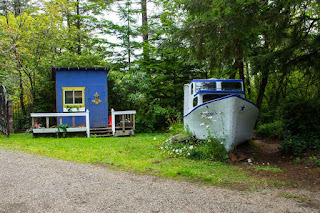 You can go inside and pretend you are on the water doing the backbreaking work of oyster harvesting. 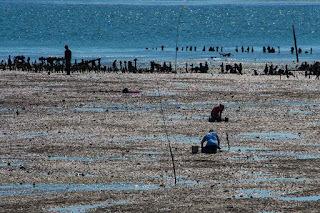 With the tides out, these two were digging for clams in one of the few public-owned areas. 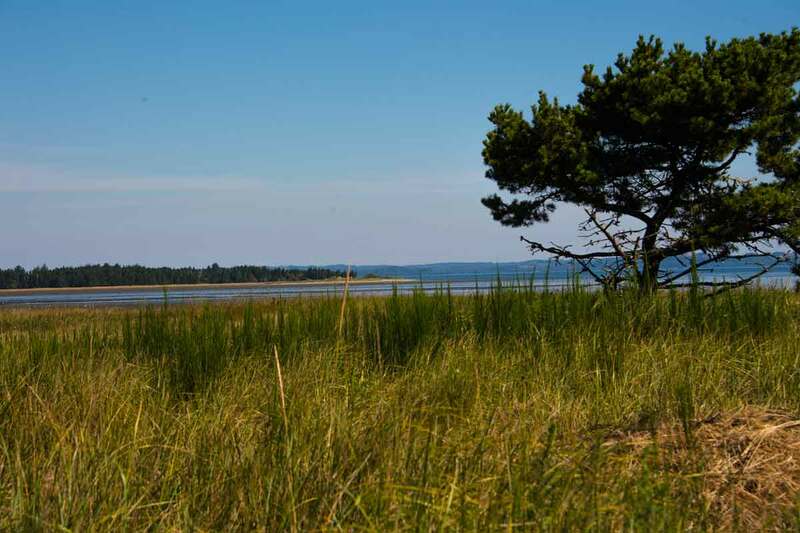 Most of the land in the bay belongs to oyster farmers, so don't walk out and start collecting. You just might get arrested! You CAN however, go on public land and harvest to your hearts content. Wear old clothes and rubber boots. 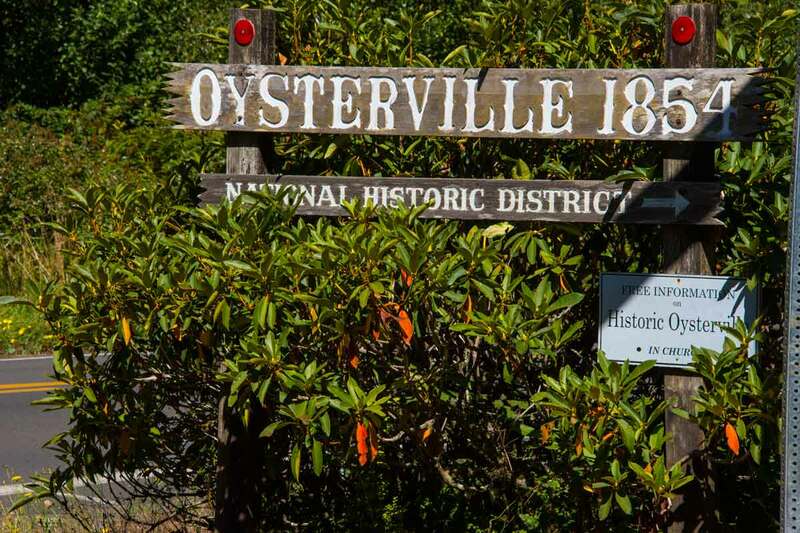 Oysterville was a booming little town when the war began. The locals wanted the County Seat to be in their town. South Bend thought THEY should be the center of government. 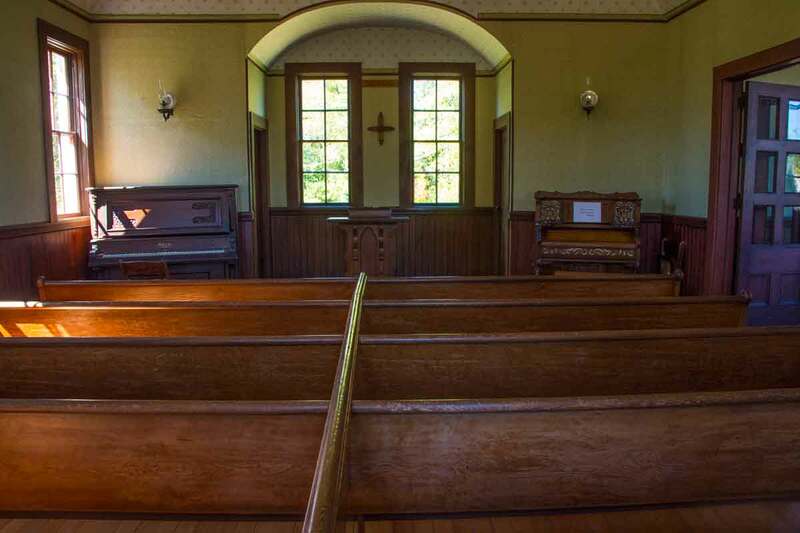 In February of 1893, someone broke in and stole all the records kept in Oysterville and delivered them to South Bend, making it the new County Seat and ending the war. 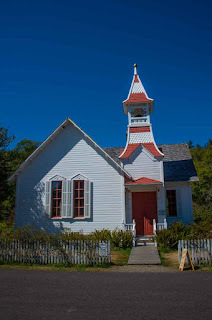 There are some geocaches here too, in case you want to learn even MORE about the little town. In 1976 it was put on the National List of Historic Districts. 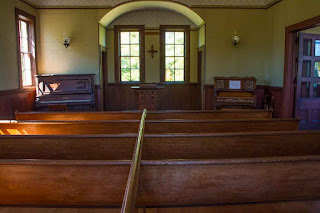 It happened the church was open the day I visited. It even has a little wood stove for your comfort. 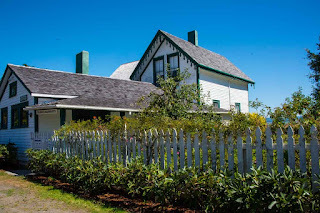 Built in 1869, this is the Tom Crellin house. Tom came from the Isle of Man, as did my grandfather. I can't wait to get back home and check out my genealogy notes. We may just be related!! You could drive through town reading the signs on the fences, but park on one of the grassy side streets and take a leisurely walk. 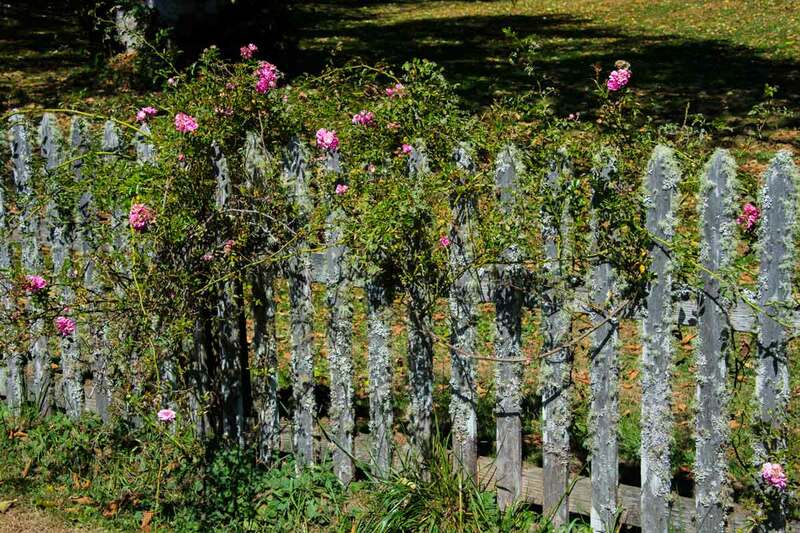 You'll see sights like this beautiful rose bush growing along the moss covered fence. 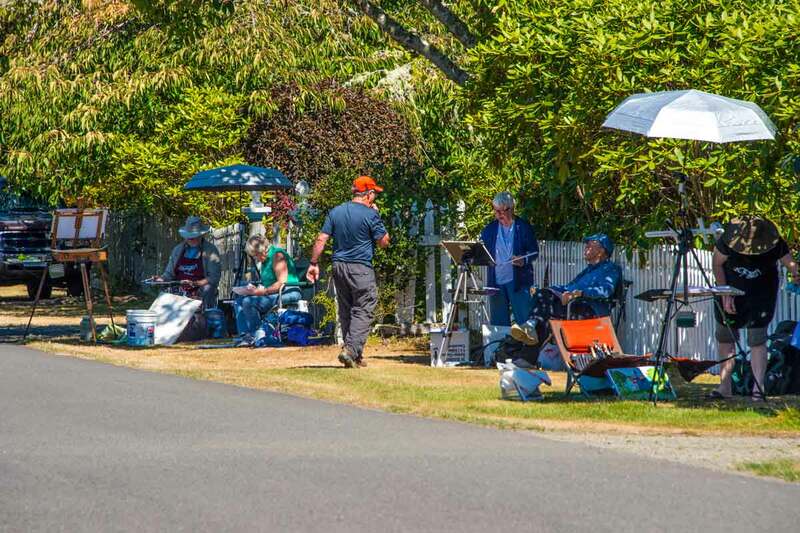 It happened that on this day, world renowned water color artist Eric Wiegardt was having a class in Oysterville. People come from all over the world to take his classes, which were held on the street this day. It was pretty cool to see not only the women, but the elder men painting away. 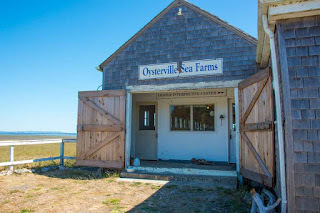 Around the corner on the bay is Oysterville Sea Farms. Yup ... another geocache, which I did NOT find. Otherwise, I would never have entered this building and gathered some more interesting history. 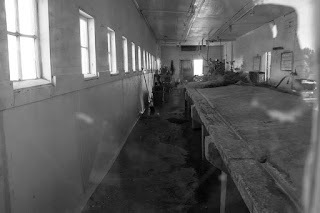 This is actually the old processing plant and cannery. 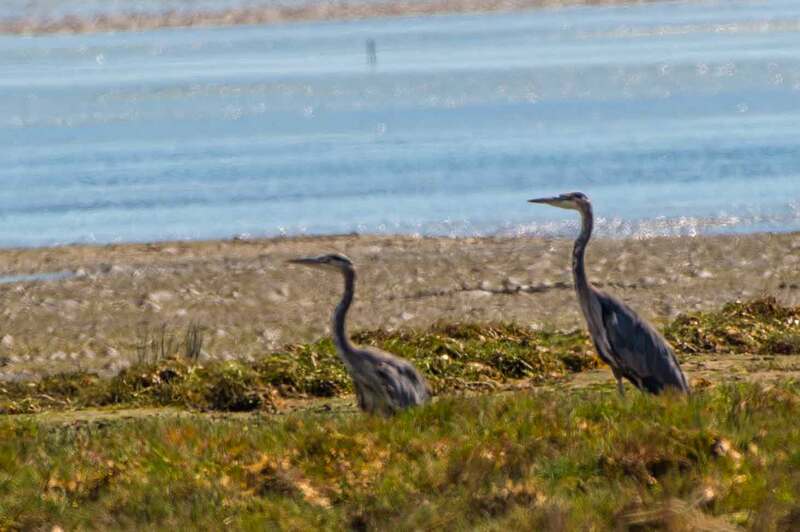 Generally, there are two things in the bay when the tide recedes. 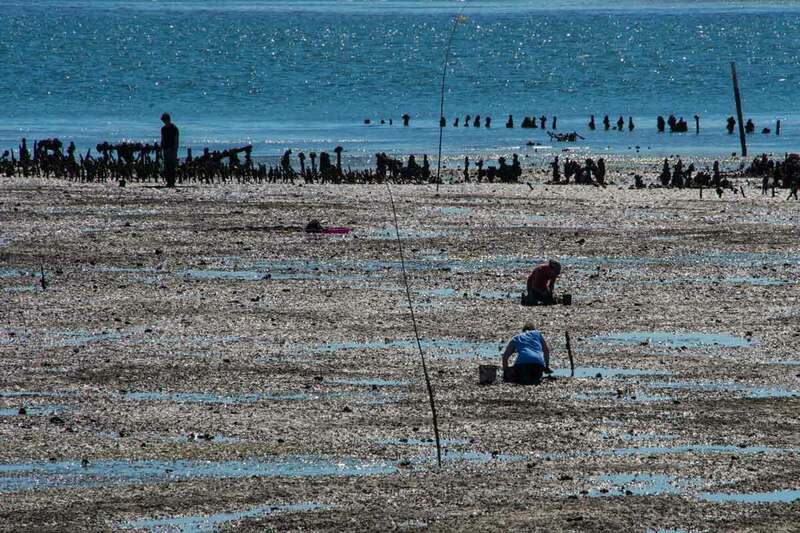 Clams, which have long necks or siphons that reach up through the mud to get air (that's why you have to DIG clams), and oysters, which grow in clumps ABOVE the mud. You just go out and gather them up off the top. Sea Farms owns 200 acres here where they farm both natural and seeded oysters. Inside there is the original long concrete table used for sorting and bagging. It's still used to this day to process their oysters for sale in the little shop next door. They don't break them open any more, it's too labor intensive. They leave that job to you. The first thing I said when I walked in the little store was "sorry, I don't like oysters", just to be sure they didn't offer me any. I felt much better when the gal said she didn't like them either ... and she WORKS there!! They do have a wide variety of other things, like cranberry cereal, cranberries, tins of various fishy things along with crackers and bottles of wine, should you want to sit on the back deck and have a snack. It's amazingly beautiful and SO quiet ... definitely worth the stop. They also had these pink razor clams that I bought for making clam chowder. I know ... that's a pretty long leap for a marginal cook. Even more so when I opened the can to find them whole!! I took three recipes off the internet, and using my NEW frying pan, fried up half a pound of bacon. No matter how the soup turns out, bacon will make it right. Surprisingly it tasted wonderful!! In the back of my mind, I was ready to haul out my shovel and dig a hole in the sand behind my rig, but it didn't happen. It was even better the second day!! At any rate, Oysterville is full of history and a great place to spend the day in peace and quiet. Don't forget to check out Sea farms. I'll be all over the peninsula today. I want to hit the Oysterville store, which is only open on weekends, and I've been invited to a Tiffin Owners potluck in the park today. VERY nice people, but that means I have to cook something since most of the chowder is gone. THAT means a trip to the store! So far, it's blustery and raining ... if you want diversified weather, 80 yesterday, 56 this morning, come to the Long Beach Peninsula!! AN AMAZING DAY OF PHOTOGRAPHY!!! Now HERE'S A Sight To See!! Moving On Up and Down!! Last Kite Festival Day ... I Promise! The Weird And The Wonderful!! Kite Festival ... Day Three ... YAY FOR SUN!!! There's More Than One Dismal Nitch!! On A Quest For Bird Food!